Then Emil Hallan arrives at The Angelus to paint a mural above its glittering subterranean pool. The handsome French artist moves into the building, shrouds his work in secrecy, and piques Vera’s curiosity, especially when the painter keeps dodging questions about his past. Is he the man he claims to be? Even as she finds herself increasingly drawn to Hallan’s warmth and passion, Vera can’t supress her suspicions. After all, she has plenty of secrets, too—and some of them involve art forgers like her bold, artistically talented former friend, Bea, who years ago, at Vassar, brought Vera to the brink of catastrophe and social exile. When the dangerous mysteries of Emil’s past are revealed, Vera faces an impossible choice—whether to cling to her familiar world of privilege and propriety or to risk her future with the enigmatic man who has taken her heart. A Fine Imitationexplores what happens when we realize that the life we’ve always led is not the life we want to have. 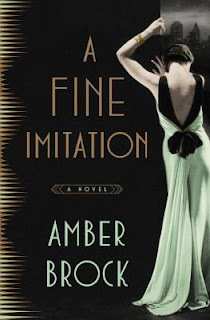 A Fine Imitation by Amber Brock is a 2016 Crown publication. I was provided a copy of this book as a part of the LibraryThing early review program. 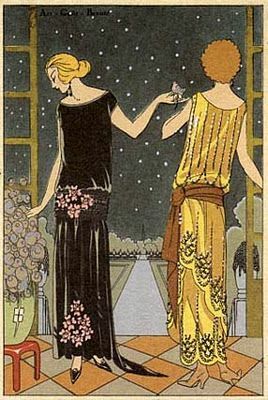 I love the 1920’s and really like books set within that time frame, which is what originally drew me to this book, not to mention that stunningly beautiful cover. As it turns out the story switches back and forth in time between 1913, where our protagonist, Vera Longacre, attended Vassar, a liberal arts college, and 1923 Manhattan, where Vera is now a wealthy socialite, trapped in a loveless marriage. While in school, Vera meets Bea, a young woman who lures Vera out of her staid shell, showing her a peek inside the world of art, and a bit of daring adventure, which also reminds her there are consequences to every action, which forces Vera to make a tough choice, one she will spend many years regretting. Having made her choice, Vera is now living a life of luxury, her life filled with parties and events, but they all seem hollow when she returns home to her big lonely house, and to cold husband who only married her for her family name and connections. But, her world is turned upside down with a chance encounter with her old school chum, a revisit to the murky world of art, and the introduction to a most mysterious French artist, Emil Hallan. Soon Vera will question everything she’s known, will take a good hard look at her life, and its substance, and will once more find herself faced with a life changing decision. Will she continue to live an empty existence or will she manage to make a great escape from the confines of her prison walls or will fear and duty and all the rules of polite society keep her chained up inside her ivory tower? For a debut novel, this book is very well written, handling the two time frames expertly, and creating characters I could feel compassion for, as well as offer up a compelling story. The only issue was the great mystery surrounding Emil was easily guessed at, but, that wasn’t really a big deal for me, since I often suspect plot lines before they are revealed. It’s the reaction the characters will have to the situation that is the true mystery and I was seriously on edge wondering what Vera would do. While things did seem to come to an abrupt end in many ways, I still found the conclusion satisfying, feeling like I was privy to an inside joke, a wonderful secret, and also loved the way Vera had the last laugh. What a wonderful, peaceful way to leave this character, and a terrific way to conclude the story. Overall, I enjoyed Vera’s journey and her story and will be keeping my eye on this author. 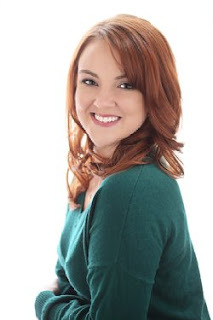 AMBER BROCK teaches British literature at an all girls' school in Atlanta. She holds an MA from the University of Georgia and lives in Smyrna with her husband, also an English teacher, and their three rescue dogs.